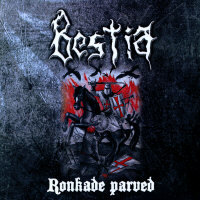 Bestia's music in 2009 is raw but epic pagan black metal with some elements of folk, thrash and death metal. Aggressive and melancholic parts are mixed together with tempo varying from slow to chainsaw-speed blasts. Lyrics can be described as dark poetry, inspired by ancient times, folklore, mythology and nordic nature. You can notice some additional instruments used in background: saxophone, viola and flute! All songs are written and performed in Estonian language. 300 handnumbered copies.